Downtown Dundee | Meet me in the "Heart of Dundee"
As we work on the building inventory for our Main Street application, we are amassing a great deal of historic photos our our beautiful downtown. We found a collection of photos from 1987… 30 years ago! We thought it would great to recreate these old photos and see the Then & Now comparison. Talented photographer and Dundee resident Tim Zeipekis, answered our call to volunteers, asking for their expertise in completing tasks to get us closer to becoming the next Michigan Main Street City! Great job and thank you Tim! As we progress through our application process, we will be sharing more of the treasure that we uncover! We have received info from the Village of Dundee about a great initiative that will surely have a dramatic impact on pedestrian safety and the walkability of our downtown. Very exciting! 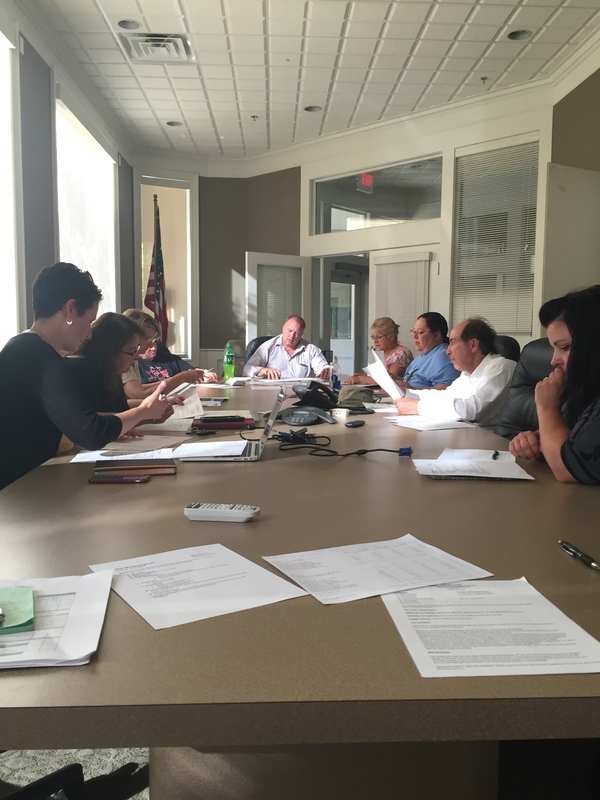 The Village of Dundee has been working with SEMCOG ( South East Michigan Council of Governments) and MDOT (Michigan Department of Transportation) to attempt to address our traffic flow problems in several areas of the Village. Some of the areas being addressed are the US 23 and Tecumseh Street corridor, including the intersection of Ann Arbor Road, and many pedestrian crossing areas. SEMCOG’s initial response has been that the Village has many areas of concern that need to be addressed. One longstanding area of concern is the intersection of Main and Ypsilanti Streets. As we continue to gather traffic information, SEMCOG has recommended that we test a change of traffic flow at this location. Because it is important that the test be conducted prior to Dundee Schools closing for Summer Break, starting this Friday April 21st the Village will be closing Ypsilanti Street at Main Street. Ypsilanti Street will remain open northbound from Van Nest Street and to vehicular traffic accessing businesses and the Municipal lot. During this test period traffic counters will be in designated areas to monitor the flow of traffic. Dundee Police and Volunteers will be at specified locations as traffic monitors. The Police Department has been working closely with Dundee Schools and with Dundee Castings on alternate traffic routes. Dundee Township and the Village will be sending out an alert on CodeRed to residents to help advise them of this test closure. The Dundee Independent and the Monroe News have also assisted in sending out the information. Dundee Schools will be sending out a message to parents sometime this week. The change in this traffic flow, if successful, may help the Village and Dundee Schools in seeking a significant grant for Safe Routes to School. Please take time to review the attached map of the traffic flow change. The Village would like to thank you for your cooperation and patience during this traffic flow test. Any questions of feedback about this initiative should be directed to the Village Office. Gathering historic photos for our building inventory and just had to share this one (circa 1950). 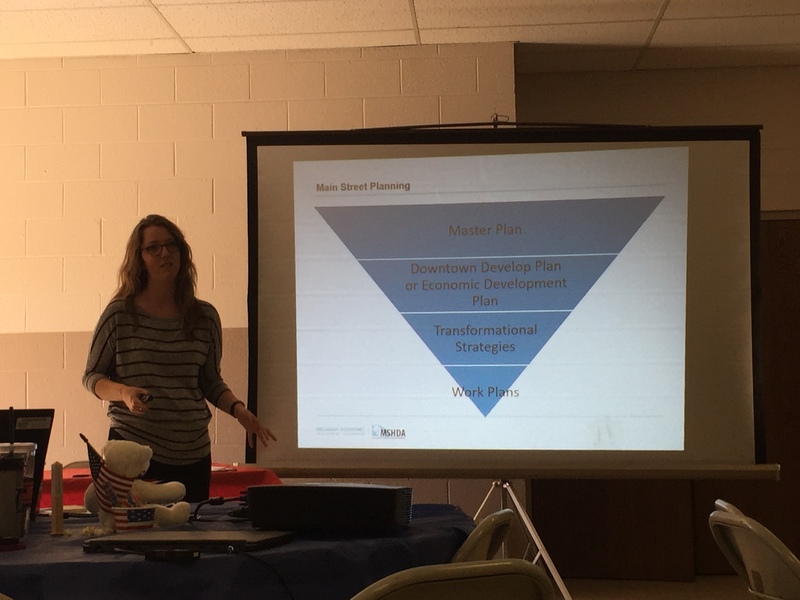 On April 13, Jordan Reeves and Beth LaPensee (members of the Dundee Main Street steering committee) attended the Main Street Basics training in Milan, Michigan. Milan entered the program last year and were able to share a lot of insights into what it takes to get accepted into the program. 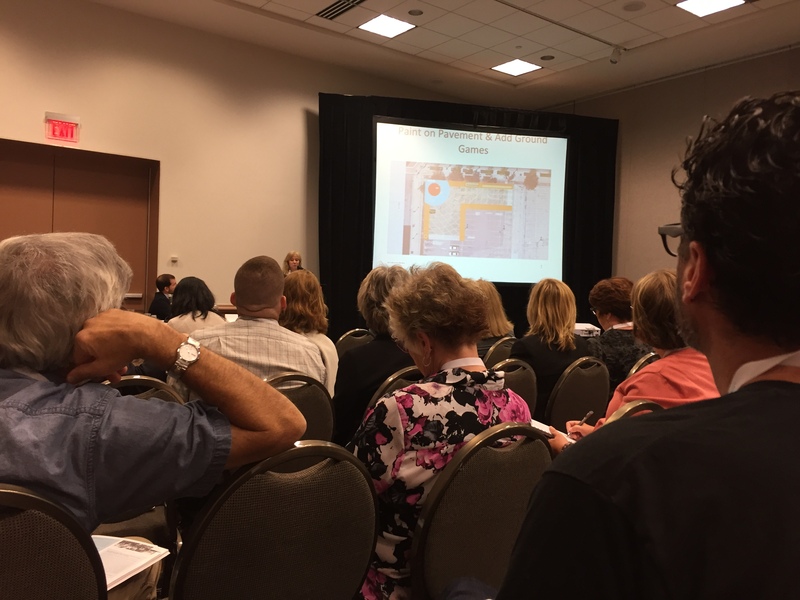 We were trilled to be able to attend training so close to home! 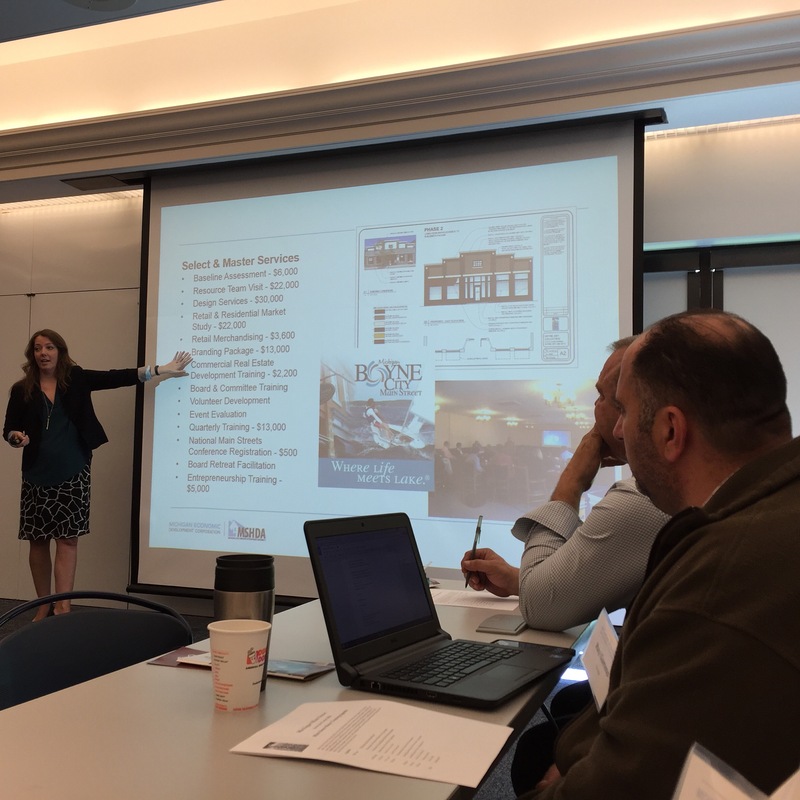 The next training, Main Street in Practice, is in Grand Haven on May 18. Thanks to the generosity of our participating and supporting businesses, there are so many prizes and other goodies for you! Passports with 3 or more stamps are entered in the prize drawing; 5 or more gets entered twice AND entered for the grand prize from Mamie & Mossie’s Gal ($150 value). Purchase is not required to get your passport stamped, but please be courteous and wait in the checkout line, if there is one, to get your stamp. Take you time and look around to see what each shop has to offer. Grand Prize: Beautiful, refinished wooden TV table set. ** Passports with 5 or more stamps get entered to win this prize. Plus free gift with purchase (while supplies last)! Plus free in-store prizes every hour! Santa will be on site for you to get a free selfie/photo with him. Our Facebook event page has all of the details. And don’t forget to check the our gift guide for some inspiration! Once the turkey has settled and you are burnt out on mall-shopping, there is Small Business Saturday. We invite you to join us at businesses and restaurants throughout Dundee to show your love and support for what your local scene has to offer. You may be surprised at the range of choices… there really is something for everyone! Check out our “Shop Small in Dundee!” gift guide for the 2016 holiday season! If you Shop Small in Dundee on November 26, you will be given a shopping passport that will be stamped or signed at each participating business you visit. At the end of your shopping excursion, you will turn in your passport. Passports with 3 or more stamps will be entered into a prize drawing! AND… passports with 5 or more stamps will be entered twice to increase your chances of winning! Businesses with * have already confirmed that they will be providing prizes for shoppers to win. That’s a lot of prizes! In addition, we have 200 Shop Small tote bags to give away to those making purchases. Limited quantity… they will go fast. Please remember that our small business owners are our friends and neighbors. Their livelihood and presence in our community depend on your support. And our community depends on the success of these small businesses. Show your support… come shopping on Nov 26 and any other day. Share this event with everyone you know. Let’s show these business how much with love them! Our Facebook event page is great for sharing and spreading the word! Press release is available for the media. Bringing Main Street to Dundee! 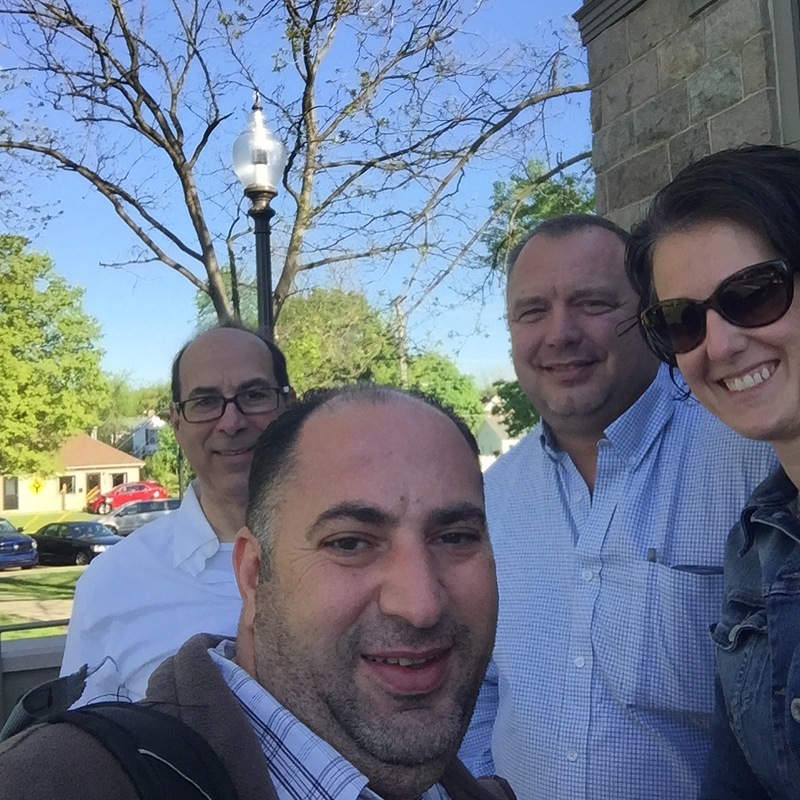 Training with Main Street staff in nearby communities that are already in the program (Howell and Wayne). Attended online training about the program, historic preservation tactics, determining the main street district, and more. Now, it is it time for us to buckle down and get serious about sharing what we have learned and what we want to do with all of you. It is easy to say that we want to create a close-knit community that sees the heart of Dundee as their center of activity and commerce. But what does that really mean? Dundee is filled with people who are committed to this place and have love it for ever. And our downtown has seen a pretty significant revitalization in recent years. We believe that the Main Street program will bring us the support, the structure, and the discipline to ensure that we continue to strengthen our downtown. We want our small businesses to thrive. We want our residents to come here first before going out of town. We want our children to have a safe and fun place to go. And we visitors to flock to us to see what we have created. This is our downtown. 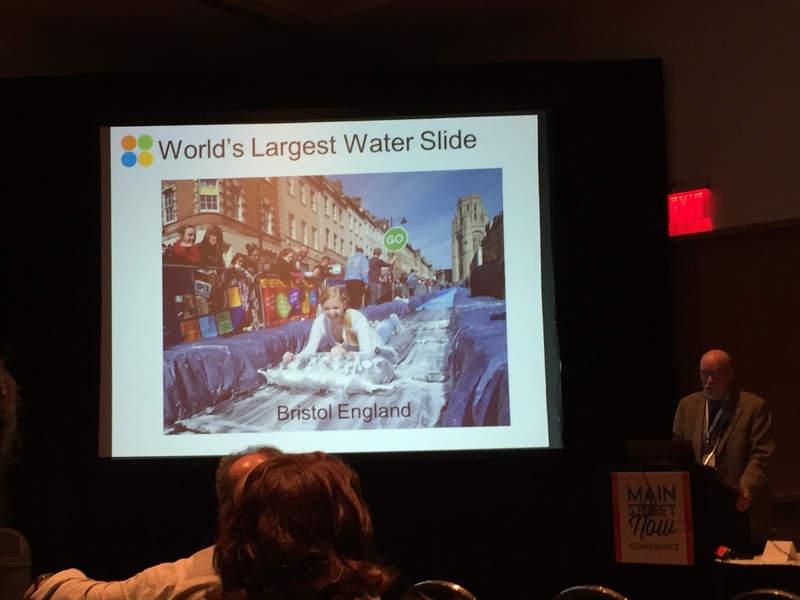 The Main Street program will help us to make the most of it. And to ensure that it will continue to be the cute, charming, lovely place it is now, long into the future. Members of the Heart of Dundee team will give an introduction to the Main Street program and why we think it is right for our community. This will be followed by a review of our progress so far and pairing volunteers with volunteer opportunities. Let us know if you are interested or planning to join on our Facebook event page. Michigan Main Street staff will be visiting our community to learn more about us. They will be giving a community presentation focused on how the program will benefit different groups in our community, for example residents and business owners. There was such a great response to our last post about our flowers downtown that we thought we’d give you some more! A huge thanks goes out to Cheryl Murphy-Smith, volunteer and resident, for taking and sharing these beautiful photos of our downtown… featuring our lovely flowers. Flowers – Westbound view from north side of Tecumseh Rd. 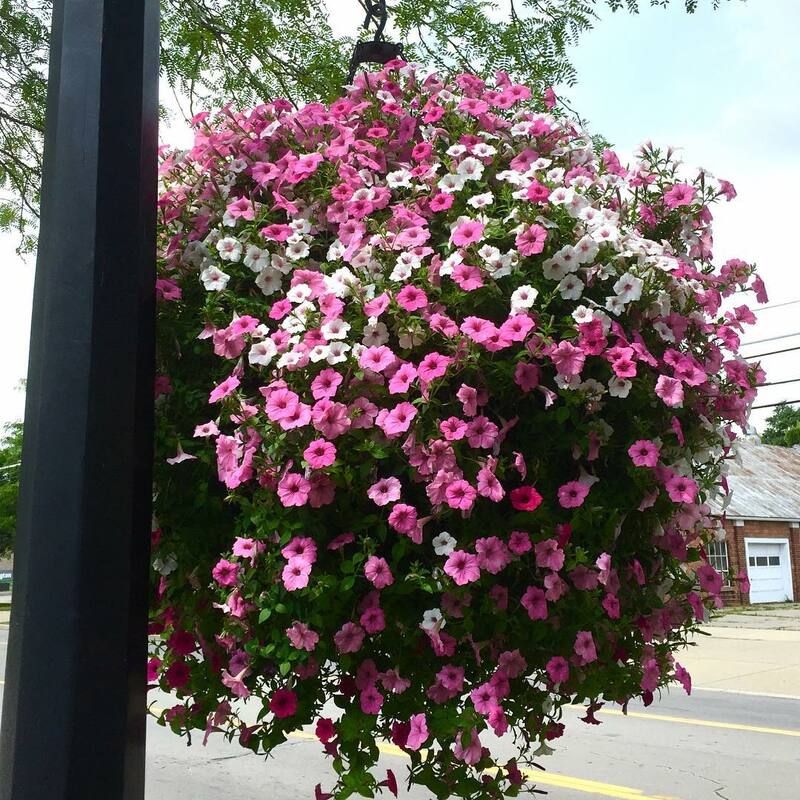 This is our 3rd year hanging flower baskets in the downtown area and they are looking great! It has been a real partnership between the village and volunteers to get the flowers to be the spectacular show they are today. Some are getting as big as 3 feet from top to bottom! Flower basket as it appears this weekend. I wonder how big it will get?! Earlier in the season, the baskets were hung and were looking quite nice. Unfortunately, we had an uncharacteristically hot and dry Memorial Day weekend and our weekday watering routine didn’t cut it. We almost lost most of the baskets that weekend. Thanks to some quick action by Denny Polito (DDA member and owner of Antiques, Collectibles and Upcycled Treasures, the shop below Swan Creek), the flowers were saved. With a small budget from the DDA, he volunteered to get a portable watering system together and to water the flowers every Saturday and Sunday morning. The DPW waters the flowers each day throughout the week. We have been getting so many complements about these flowers and hope you are enjoying them too! People always want to know where we get them. Here it is: Koraleski Flower Center. Flower basket when it was new – as a point of comparison. We would love to expand our coverage of flower baskets – over the bridge, along the river, around the triangle, etc… But we’ll need help to do that. We have learned that these flowers need water every day to make it thought the long hot summer. As we begin planning for next year’s flower purchases, we’ll be reaching out to our residents. We would like to create a flower program for the downtown and get more volunteers involved in keeping our downtown colorful throughout the summer!